Today is a good day for FolderBuddy ! The application is entering the Top 100 application in the Productivity category. I spent sometimes many weeks ago to figure out a little bit more information on how to obtain the actual rank of an application that is not in the Top 100. I am happy to report that I have a good solution that can track the top 1000 in each category of the AppStore. So I have been tracking now for many weeks all my applications and see daily how do they rank. Here is below the graph showing FolderBuddy rank for the past couple days. And yes starting late afternoon on the 26th, FolderBuddy is getting more traction and jumped from the 969 position to 358 in 12 hours, and the fun ride continue from there. Click the image to see a larger picture. This is not too much a surprise that FolderBuddy got suddenly a big traction. Brian and I have decided to invest in some well crafted ad program that does trigger the effect you're seeing above ! 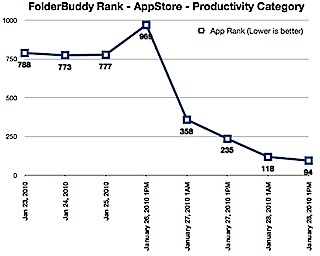 [UPDATE] This morning 01/29/10 I checked the ranking in the AppStore and FolderBuddy is now ranked #77 !